This is becoming my favourite butterfly! The amount of detail and colours is staggering. I am new to spreading butterfly specimens, caused quite a lot of damage to the specimen when attempting to spread them. The zoning colours are very pleasing even at an eye level of magnification. When magnified, it's even better! Those are very nicely done. I love butterfly wings too, especially Morpho. In your pictures,especially the second one, you can clearly see the difference between the wider, light blue cover scales and the narrower, dark blue ground scales. 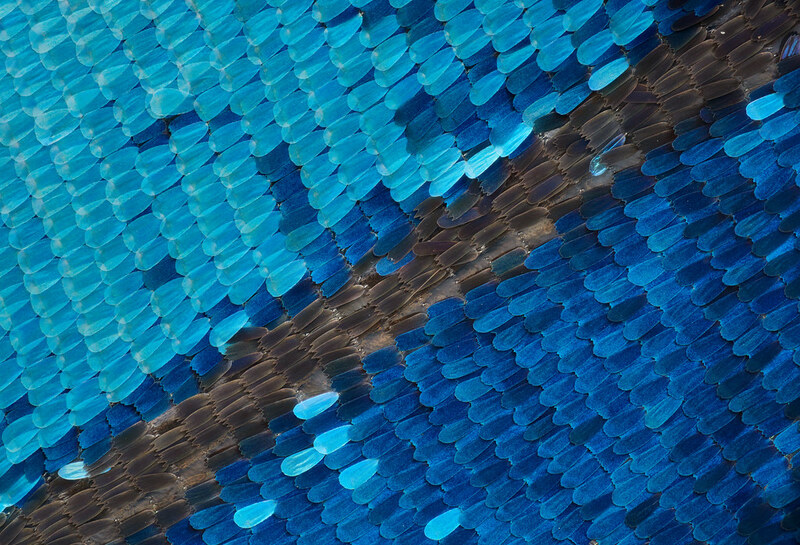 The relative sizes and arrangement of these scale types determines whether the Morpho species is shiny and reflective like a mirror, or a softer less directional pearly blue. Very nice, the second one is my favourite. Macro_cosmos, on your flickr page you mention that these are a blend of two exposures. They are very nicely blended. Did you take two separate stacks, one of each exposure, and then blend, or did you take two bracketed shots at each step, blend them, and then stack? Or did you take just one image at each step and develop the RAW file at two different brightnesses? Whatever you did, it worked well. Also I see on your flickr page that you were considering removing some of the transparent scales to show the blue scales, but you discarded the idea because it was too tedious. 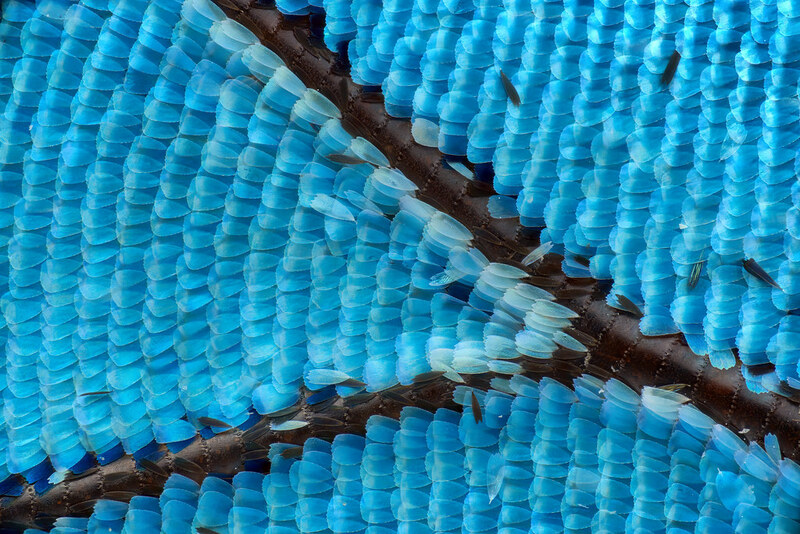 People who study morphos sometimes have removed those scales using transparent tape. Very fast and easy.